The American veterans who dedicated their lives to serve their nation deserve nothing short of thanks, gratitude, and support. There is no doubt that what they did for their country is a debt that can never be repaid, but it is the duty of American citizens to honor their sacrifice and show them the respect they earned. 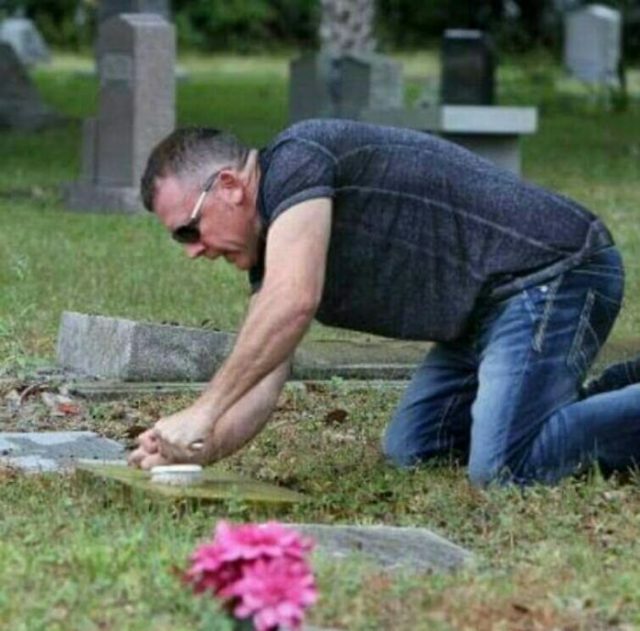 Speaking of respect, here is a story of a man named Andrew Lumish, who spends every Sunday cleaning the forgotten tombstones of military veterans in Florida. In today’s hard-working world many of us would probably spend the weekend relaxing in front of the TV, or maybe in the countryside away from crowded cities. This is not the case with Lumish, who uses his one day off to honor the veterans by patiently cleaning their decaying tombstones. The process seems to be quite complicated. 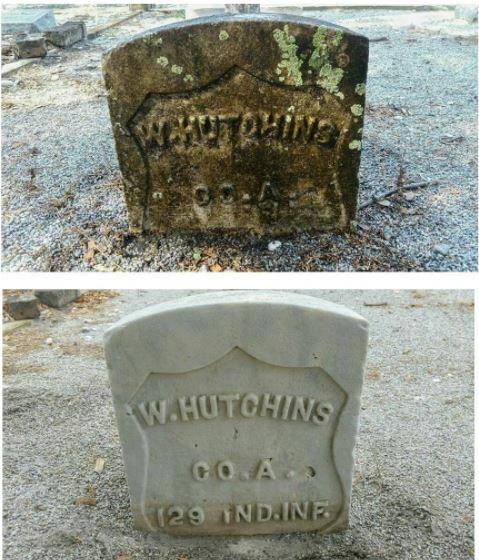 Lumish sometimes spends up to four months cleaning some of these tombstones. Aside from this unusual hobby, Lumish is a history buff and also enjoys photography. 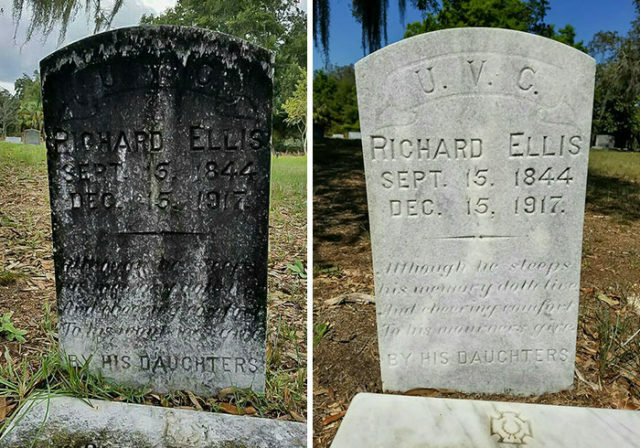 He told the Tampa Bay Times that it all started in Oaklawn Cemetery, where he went to take photos of historic graves. He found out that many of the tombstones for military veterans were practically destroyed. 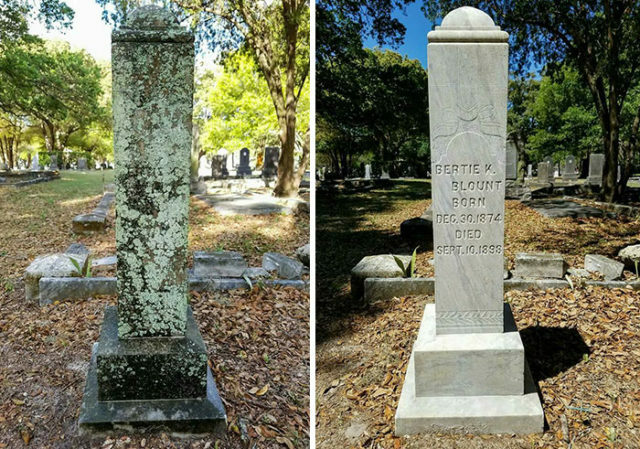 Lumish works six days a week as a carpet and upholstery cleaner but still loves spending his day off scrubbing forgotten tombstones. He made this his life mission. In 2016, he told CBS News that what disturbed him the most was that veterans resting beneath the tombstones were forgotten. He couldn’t properly thank them and understand who they were. The Good Cemeterian started his mission back in 2013. 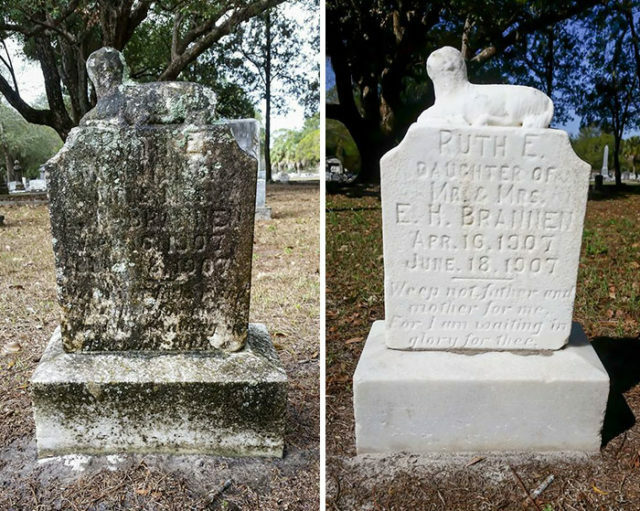 He told the Tampa Bay Times that he had restored around 300 tombstones by November 2015. But Lumish is not just uncovering the names of the military veterans; he is also uncovering the history behind the names. His goal is to bring their memory and resting place back to life. 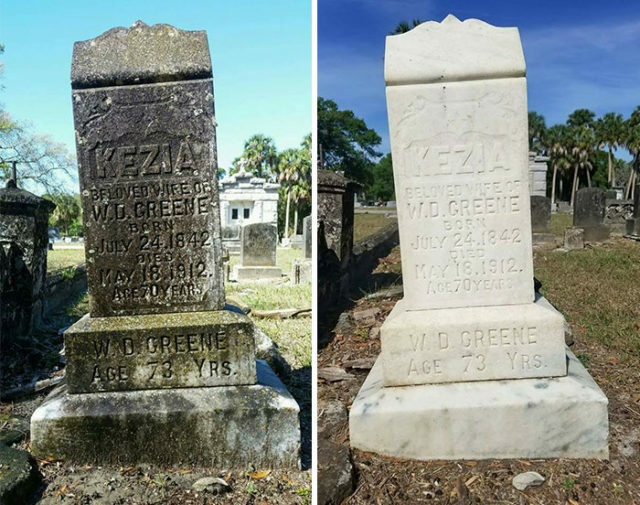 When Lumish finishes cleaning the grave markers he shares a before and after photo on his Facebook and Instagram page, adding important historical facts about the veterans. 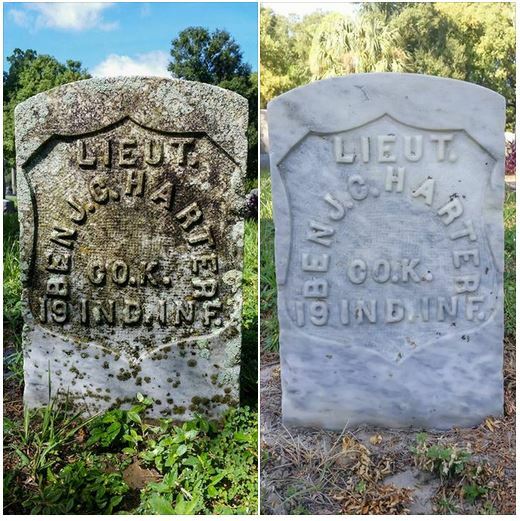 The tombstone of a Civil War veteran named Henry J. Fletcher was the first Lumish restored. He also cleaned another one the same day. Although he is a professional cleaner, Lumish had never cleaned tombstones before. He managed to develop his own unique method and from what we can see, it works pretty well. The results are stunning. Many people were interested in learning how exactly Lumish restores tombstones so that they could also join his mission and follow his steps. 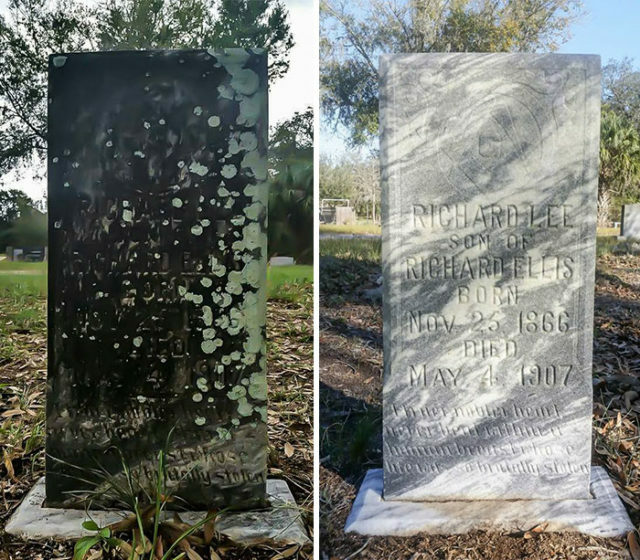 On his Facebook page titled The Good Cemetarian, he shares some important instructions about the process of cleaning tombstones. He notes that the product he uses is called D/2 Biological Solution and that it can be used for cleaning granite, marble, and sandstone monuments. Many veterans and their families from all over the country thank him for what he does, but as Lumish told CBS News, he feels that he is unworthy of the same respect as the veterans who choose to serve the United States. Keeping the memories of American veterans alive is what Lumish truly loves and what inspires him to continue his mission. He’s done a great job so far, and he has taught us how important it is never to forget the sacrifices of the veterans and to always show them the respect they deserved.